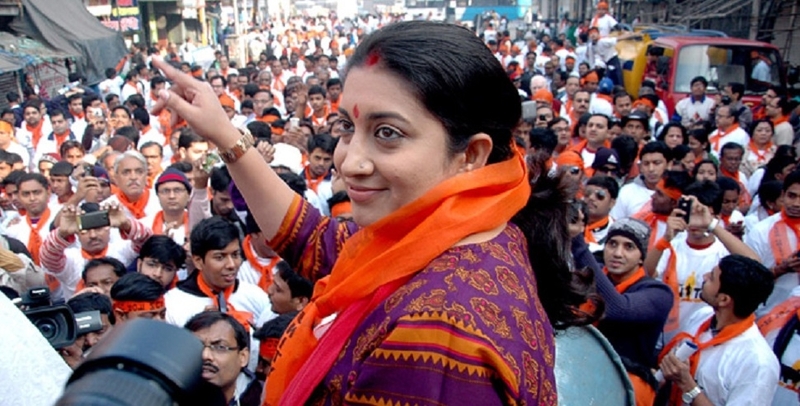 UNION Minister Smriti Irani on Thursday filed nomination papers from Amethi, pitting herself against Congress President Rahul Gandhi who has won thrice from the Lok Sabha constituency regarded as Gandhi family pocket borough. Irani filed the nomination after a road show, which followed a similar route taken by the one organised by the Congress when Rahul Gandhi submitted his own papers here on Wednesday. Uttar Pradesh Chief Minister Yogi Adityanath accompanied her in a show of strength in the constituency, which has been nursed by the Union Textiles Minister even after she was defeated by Gandhi last time. She lost the 2014 election by over a lakh votes, but the shrunken margin of victory for Gandhi boosted the BJP’s hopes. The Congress President is also contesting from a second constituency, Wayanad in Kerala, this time, prompting the BJP to claim that he is “scared” to take on Irani. Irani, who has been lashing out at Gandhi for “missing” from Amethi and for its “lack of development,” continued to attack him on Thursday, questioning his “silence” over the Income Tax raids against aides of Madhya Pradesh Chief Minister Kamal Nath. The road show began with prayers at the Gauriganj’s Budhanmaai temple, where her husband Zubin Irani accompanied her. Enthusiastic party workers took part in the road show ahead of the nomination, beating drums and showering rose petals. Many women wore saffron saris and men had “angochhas” in the same colour flung over their shoulders. They wore ‘Main bhi chowkidar’ (I am also a watchman) caps, in support of Prime Minister Narendra Modi. Irani submitted four sets of nomination papers to district election officer R M Mishra. Taking with reporters, Irani targeted her rival over the recent I-T raids. The Income Tax Department has claimed it has detected a racket in collection of unaccounted cash, running into crores. “Rahul Gandhi is still silent over the fact that details of about Rs 280 crore have emerged from the residence of an aide of Kamal Nath,” she charged. “Rahul’s silence exposes his reality.” Irani said the people are looking for a vision in these elections for the development of the country, asserting that Modi will again emerge as Prime Minister.